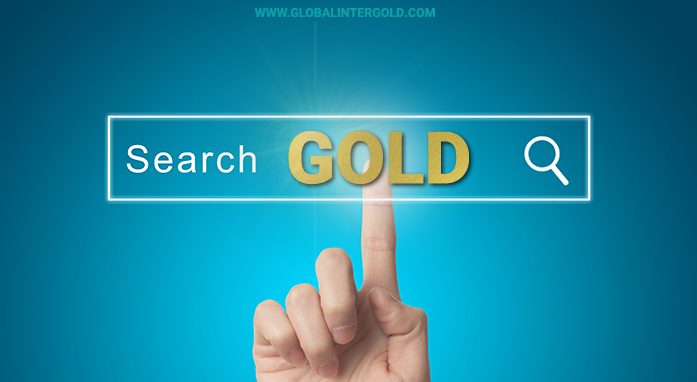 Gold is a precious metal that has always been in demand, serving as a universal global currency. People always have valued and accumulated gold, – a guarantee of stability and personal well-being. When it comes to power and economic independence of the state, this precious metal holds a paramount importance. 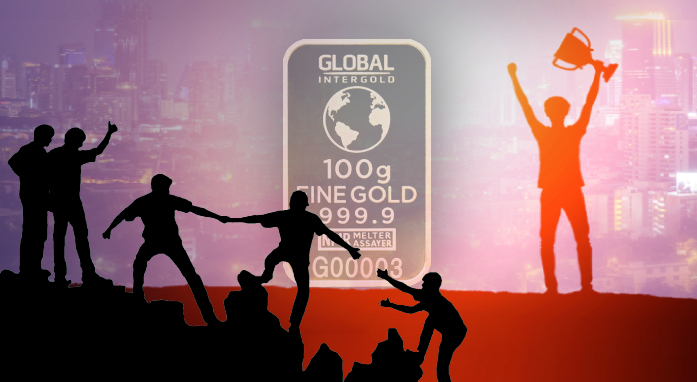 What is the gold reserve? The gold reserve was created to provide a monetary unit of a certain state with a value that is equivalent to a specific amount of gold. One can adjust the exchange rate of the domestic currency by buying or selling gold on the global market. International reserves form a "safety cushion", a stabilizer in the event of a crisis. A gold reserve increase means an increase of the economic stability of the state. The gold reserve is the gold stock of the state, regulated under the jurisdiction of the Central Bank or the Ministry of Finance of the country. In the photo: gold reserves of the gold-holding countries worldwide as of 2016. According to the World Gold Council data, reserves of the yellow metal in all countries of the world as of April 2018 amount to 33 829 tons, 10 782 of which belong to the European Union. The United States has the largest gold reserve among other countries. However, the total amount of precious metal stocks within the European Union is much greater than the total amount of the U.S. gold reserves. The U.S. holds the world's leading position in terms of gold reserves. According to the executive order (issued in 1933) regarding the nationalization of gold, all legal entities as well as individuals were forced to surrender their gold to the state at a price of $ 20,66 per ounce. After the confiscation, the price of gold reached $35 per ounce. The gold reserve of America reached its maximum during the Second World War — 20 205 tons of the precious metal. Fixed gold prices and fixed exchange rates were established during the years of the Bretton Woods system (a period from 1944 to 1976). At that time, the U.S. actively used the yellow metal to stabilize the domestic currency, which reduced the country's precious stockpile by 2,5 times — to 8133,5 tons. In addition to its own deposits of gold, the gold reserves of 50 other countries are held in the U.S. depositories. 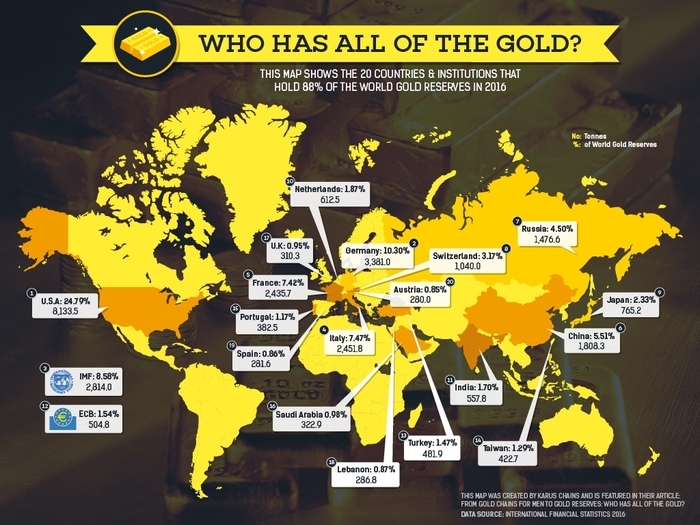 In terms of gold reserves, Germany is the leader among European countries. In 1951, during the wave of global economic growth, Germany began to form its own gold reserve. The peak was reached in 1968 — 4000 tons. Germany actively bought gold on the stock exchanges of London, Paris and New York, and stored it there too. In 2013, the country's gold reserve amounted to 3391 tons, of which only 31% was stored in its own system. Germany began the process of withdrawing its gold reserves from foreign storage facilities starting from that same year onwards. 111 tons of gold were returned from the United States, 105 tons — from France. According to the data for the end of 2016, the storage in Frankfurt am Main contained 47.9% of Germany's gold. The rest of the gold reserve is still stored in other countries. 5 tons of gold used for coinage and further sale in Germany annually. Other operations with the precious metal are not conducted. Like many other countries of the European Union, Germany signed another "Central Bank Gold Agreement" in 2014, and the county pledges not to sell the precious metal in large quantities until 2019. Italy is on the third place in the world in terms of the amount of national gold reserves. The Central Bank of the country reported the storage of 50% of the gold reserve (1199,4 tons) in the depository of the Bank of Italy in Rome. 1200 tons from this amount are gold bars, the rest of it — golden coins. 600 tons of Italian gold are stored in the Federal Reserve Bank of the United States. 12 tons of the precious metal are stored in the Bank of England. 120 tons of Italian gold are stored in the National Bank of Switzerland. This country ranks fourth in Europe in terms of state gold reserves. France, like many other states, signed the Bretton Woods agreement in 1944. The exchange rate has been stabilized in the country. Over time, the dollar began to dominate international payment systems and its reserves grew rapidly in European countries. This led to the destabilization of the national currencies of European countries, including the French franc. An economist and adviser to the French President Charles de Gaulle Jacques Rueff advocated for strengthening the role of gold in international trade. In 1960, he proposed to exchange significant amount of dollar reserves for the precious metal. The country's gold reserves increased from 73% to 86% within a two-year period. France exchanged 874 million dollars for gold in 1965, and the amount of gold reserves reached 4,400 tons. Unlike other European head of states, the French government insisted that gold bars would be exported from the United States. The country is the leader in terms of the amount of national gold among the CIS countries and ranks fifth in the world in terms of gold reserves. Russia annually increases its international reserves, actively mining gold. The country occupies the second place (after China) among the miners of gold. An increase in the gold reserves of Russia amounted to 223,6 tons in 2017. According to the data for the beginning of 2018, the gold reserves of the Russian Federation amounted to 17,7% of its foreign exchange reserves. Two-thirds of the state's gold reserves are stored in the Central Depository of the Bank of Russia in Moscow. 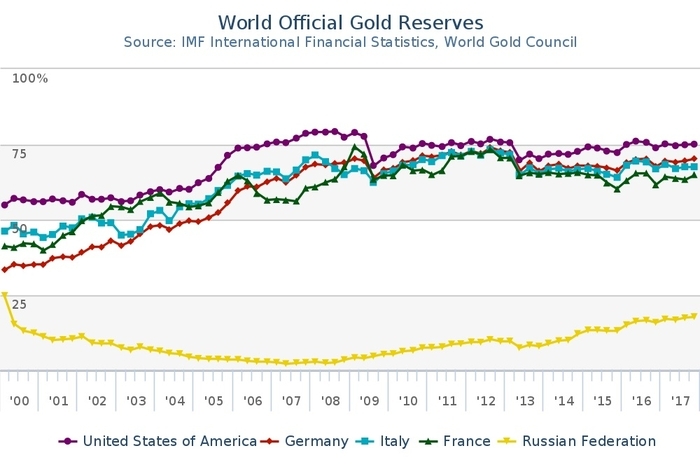 In the graph: the percentage of precious metal in the total national reserves of the above-mentioned countries for the period from 2000 to 2017, according to the World Gold Council. 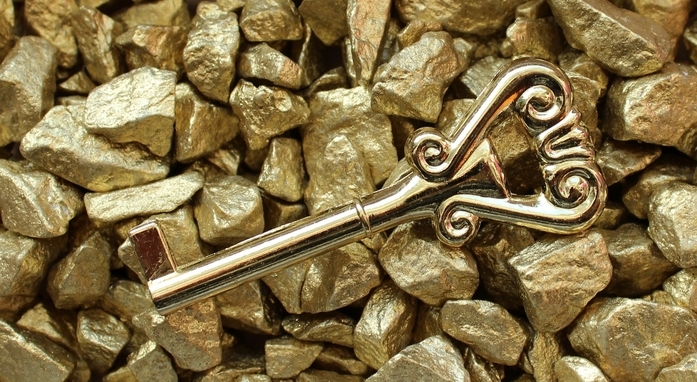 Gold is the best tool for preserving and accumulating capital. Experts and analysts consider it a reliable asset and advise to include 25% of the precious metal into the investment portfolio. Gold holds a stable position in the global economy and its liquidity does not depend on state guarantees. Investors buy the yellow metal with confidence, trying to protect their money from inflation. Having personal gold savings is a guarantee of your financial security, the basis of prosperity and independence. Buy the precious metal now! Strengthen your financial security!